GARRETT - When the "Wiggler," was produced in 1906, three fishing buddies in Garrett probably had no idea their brainchild would make their small town a Mecca for future generations of fishermen. They founded the Creek Chub Bait Co., which would became the largest manufacturer of wooden artificial fish bait in the world. Henry S. Dills, George M. Schulthess and Carl H. Heinzerling compiled their expertise to create surprisingly effective artificial baits. The first baits were fashioned in Schulthess' basement on South Franklin Street, until the operation moved to 109-11 E. Keyser St.
Dills, who designed and made the first lures, was the inventor - "the real brains, who knew how to make a bait," according to local, present-day bait collector Ron Matthews. Schulthess, four-term mayor of Garrett, and Heinzerling, who was in the hardware business, were the investors who helped get the company off the ground. The three called the company Creek Chub for a type of minnow found in surrounding creeks. Dills spent hours whittling tiny pieces of wood, then more hours sitting in a chair next to his bathtub at home, taking notes on how his bait-creations performed in the water. He even rode his bicycle to and from Bixler Lake in Kendallville to test the lures. Soon, the three devised an innovative technique for painting a lifelike-looking scale finish on their lures. A young woman was hired to devise the delicate painting processes. The operation was patented and totally revolutionized the way baits were made. Later, more women were hired and the company moved to a large building on Randolph Street. Most of the workers were women because Dills believed their smaller hands and painting skills were more dexterous and artful. The company incorporated in about 1916, and in 1918, an addition was made to the building. The product's lure was not accidental. The company had a mission statement and a sophisticated set of goals and strategies that made the cut in the worldwide market, even during the Depression and the reductions during World War II. The lures were of a quality that would not be compromised. The company had an exclusive process of treating the wood to prevent the finish from cracking or scaling. Each bait was hand-painted anywhere from seven to 14 times, with hook holes and openings treated after painting to seal the wood and prevent waterlogging. The company advertised extensively, spending $25,000-$30,000 a year to feature the well-drawn and photographed lures that soon became famous in 48 states and 18 countries. Creek Chub's mailing list contained 75,000 names. "Genuine cedar bodies in all floating lures - no pine or basswood. These woods are not suitable for bait bodies," and, "Extra high finish on all nickeled parts. We do our own plating and polishing and do it right. Most metal parts are now made of stainless, rustless alloys better and stronger than hereforto used." One of the most appealing drawing cards for the bait was its unusual, lifelike shape and delicate, sometimes intricate coloring. Several sported scales, eyes and bristly tails. Some were jointed, and all had the first stainless-steel hardware and tinned hooks found in bait manufacturing. C.C.B. Co. lures had names such as Injured Minnow, Cray-Z-Fish, Plunker and Darter. One lure was painted with a hazy, two-tone design called the wedding veil - painted in an all-over deep moss green, overlaid with lace and painted again in a medium neon green to simulate fish scales. The "Victory Bomber" was made for World War II troops with a dot-dot-dash and a "V" on its sides, celebrating the Morse Code for "Victory." Another bait was called the "Dingbat" after a C.C.B. 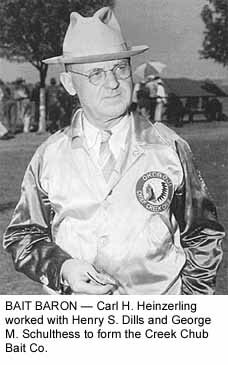 Co. employee nicknamed Dingbat, whose real name was Earl Weaver. The most popular lure was the "Pikie," which sold by the thousands. "The Pikie Minnow was first designed in 1921, and has been the backbone of the Creek Chub Tackle Co. for all of those 46 years," Harry Heinzerling wrote in 1967. "It's a lot of fun to fish with a Pikie, the jointed model, especially. As it comes through the water, you'll get the feeling you're getting your money's worth. Maybe it's the way it shimmies through the water with that back hook, giving the impression of fast tail action." The Pikie lure held, at that time, the world record muskie-catch - 69 pounds, 15 ounces, by a New York fisherman. 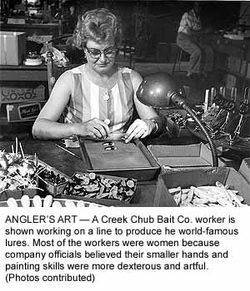 By 1935, about 40 women were Creek Chub Bait Co. employees along with a handful of men. A news article from the mid-'30s said "all enjoy their relations with their employer." The group, including employers and employees, took several company outings together - picnics, dinners and parties. Year after year the same employees' photographs are recorded at lakes and at each others' homes. However, on Sept. 25, 1941, a 17-day strike was settled, with several concessions won for C.C.B. Co. company employees: the union was recognized as the sole bargaining unit, future disputes were to be settled by arbitration without work stoppage, seniority rights were established, hour and piece work rates were increased, overtime and leaves of absence were adjusted - with no discrimination against striking employees when they returned to work. After the contract was signed, both sides commented for the local paper on the "spirit of cooperation" of the opposing side. As the founders of the company retired, they passed the company on to their children. LeRoy Schulthess became president, Gordon Dills, secretary, and Mrs. Howard Schulthess, treasurer. Harry Heinzerling became executive vice president and general manager. The company continued to purchase hooks for its baits from Mustad in Norway as it had for most of its years in business, except when that country was occupied by Germany. Wood for the bait bodies was purchased from several states as well as foreign countries. The byword for employees and company officials alike was quality. All were proud of their company's impact on the marketplace and its innovatively stylized products. An article published in 1958 described Creek Chub products: "There had been artificial plugs prior to Creek Chubs. Most of them were rather unimaginative. To be sure, there had been spoons, spinners and flies, too, for centuries, but the credit for imparting a natural wiggle to a piece of wood is claimed by Creek Chub." Eventually, the company's insistence on quality clashed with other companies' newly introduced plastic lures. It soon became a major price issue. In compromise, plastic lures under the Creek Chub name were produced an outfit called Lazy Ike, which was then picked up by a company in Fort Smith, Ark., called Pradco. "Everything was going plastic," Matthews explained about the dilemma. "You can't find a wooden lure. You can still buy a Creek Chub bait from Pradco, but they're plastic. Creek Chub did make some plastic lures just before they closed." After producing the most innovative and beautiful baits in the world for more than 70 years, the small company in Garrett became a memory. 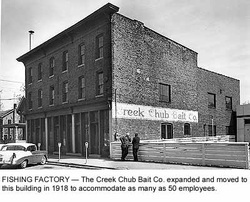 In 1978, the nearly 75-year-old Creek Chub Bait Co. closed its doors for the last time. In 1989, the building was torn down. Twenty years later, former employees from Creek Chub gather in their old stomping grounds to swap stories and old fishing lures at the Creek Chub Bait Co. reunion. For the first time, Garrett's summertime festival features something other than railroads. The big lure became the company that, for millions of people, put Garrett on the map. Amid a revival of interest in the former Creek Chub Bait Co. and its products, Matthews, Steve Pepple, Joe Hardenbrook and Andy Giegold organized the first annual C.C.B. Co. reunion in 1998. A tent was set up for a fishing collectibles auction in the street between the Ort's Building, home of the C.C.B. Co. Reunion, and the site of the old C.C.B. factory. About 58 former C.C.B. Co. employees and fishing and bait collecting enthusiasts from as far away as Los Angeles, Houston and New York created the fisherman's dream - dozens of displays of old and rare lures, advertising memorabilia, magazine articles, photographs, company ledgers, handwritten correspondence and dozens of other items. A casting tournament the reunion's second year was sponsored by Midwest Outdoors Magazine and held at the Garrett Pool in Feick Park in honor of past C.C.B. Co. employees and former Casting Club members. The onetime owner of Smith's Drug Store in downtown Garrett in the 1950s and '60s, Harold Smith, wrote a detailed history of the C.C.B. Co. In it he described the colorful history of the three owners of the company. Most die-hard C.C.B. Co. bait collectors own the book, which is filled with pages of color photographs and descriptions of Creek Chub baits.